Description: Just click for a sense of security with lights that brighten up the area beneath and around your vehicle. Fades in and out with the dome light. Goes on when you press the key fob, press the entry button or open doors. NOTE: May need 999Q9-AY001 for installation. This product requires: 999Q9-AY001. Thousands of customers have trusted Nissan Wholesale Direct for their factory grade, OEM Nissan parts and accessories. Browse or search our inventory with our user-friendly VIN, vehicle or part search options. 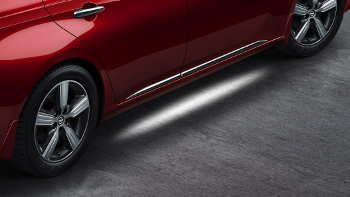 With a comprehensive inventory of genuine Nissan parts and accessories in stock and convenient shipping we can get you the Exterior Welcome Lighting you need fast! Our team is here to help as your satisfaction is our top priority. You can trust Nissan Wholesale Direct to be the source for all your Nissan parts and accessory needs.